Posted on 23 June 2015 under Gandhi, Satyagraha, Women & Nonviolence. Every leader who seeks to win a battle without violence and who presumes to precipitate a war against conventional attitudes and arrangements, however prejudiced they may be, would do well to probe the subtleties distinguishing satyagraha from other forms of action also claiming to be nonviolent. There are essential elements in Gandhian satyagraha which do not readily meet the eye. The readiness with which Gandhi’s name is invoked and the self-satisfaction with which leaders of movements throughout the world make reference to Gandhian methods are not always backed by an understanding of either the subtleties or the basic principles of satyagraha. It is important to pose a question and to state a challenge to those who believe that they know how a Gandhian movement is to be conducted. For nonviolence alone is weak, non-cooperation in itself could lead to defeat, and civil disobedience without creative action may end in alienation. How, then, does satyagraha differ from other approaches? This question can be explored by contrasting satyagraha with concepts of passive resistance defined by the Indian word duragraha. Duragraha means prejudgment. Perhaps better than any other single word, it connotes the attributes of passive resistance. Duragraha may be said to be stubborn resistance in a cause, or willfulness. The distinctions between duragraha and satyagraha, when these words are used to designate concepts of direct social action, are to be found in each of the major facets of such action. (1) Let us examine: (a) the character of the objective for which the action is undertaken; (b) the process through which the objective is expected to be secured, and (c) the styles which characterize the respective approaches. Satyagraha and duragraha are compared below in each of these three aspects by considering their relative treatment of first, pressure and persuasion, and second, guilt and responsibility. Finally, we shall have a look at the meaning and limitations of symbolic violence. If non-cooperation, civil disobedience, fasting, and nonviolent strikes represent only partial but never essential expressions of satyagraha in action, this is because the Gandhian method goes well beyond the more simple and direct use of pressure. The objective of satyagraha is the constructive transforming of relationships in a manner which not only effects a change of policy but also assures the restructuring of the situation which led to conflict. This calls for a modification of attitudes and requires fulfillment of the significant needs of all parties originally in conflict. The fulfilling of needs is both an objective and a means for effecting fundamental change. The immediate cause for action, both of a satyagrahic and duragrahic nature, is an allegedly unjust policy. The search for a solution to the conflict which results, once the policy and its proponents are opposed, is understood by the duragrahi in terms of applying pressure with skill and in sufficient strength to force the opponent to stand down. In satyagraha the search itself partakes of the objective, for it affords the stimulation and provides the satisfactions which attend all creative efforts. The dynamics of satyagraha are end-creating. The objective is, conceptually, only a starting point. The end cannot be predicted, and must necessarily be left open. As we shall see below, the process, as it relates ends to means, is complex. In contrast, duragraha approaches the conflict with a set of prejudgments. The opponent is, ipso facto, wrong. The objective is to overcome the opponent and to destroy his position. The task the duragrahi sets himself is to demonstrate the fallacious or immoral character of the position held by the opponent, and to substitute for it a preconceived correct and morally right position. A duragraha campaign has the satisfying advantage of being direct and simple. The objective is given, and the end conclusive. Pressure is understood in duragraha in the sense of steady pushing or thrusting to effect weight or burden, and usually it results in distress. Pressure in the mechanical sense is not developed further into a process reflecting influences from the opposition or, to be more exact, duragraha does not develop such a process through design. The strike is typical of this straightforward application of pressure. The strike is commonly used to effect economic pressure, and is intended to hurt business, or to strain relationships so that normal functions are brought to a halt, or at least inhibited. Normal functioning cannot be resumed until policy changes are instituted. In the field of labor relations, sophisticated forms of collective bargaining represent an advanced technique of negotiation and compromise. Relationships do indeed change, but these changes are in degree. The process of strike, or passive resistance, or duragraha in its most common forms, amounts to the intensification of pressure or the shifting of points of attack until a settlement is reached through capitulation or through compromise. The objective does not partake of a search, nor does it require an explicit intent to discover solutions which will satisfy the opponent. Duragraha seeks concessions; satyagraha sets out to develop alternatives which will satisfy antagonists on all sides. Creativity is essential in satyagraha, not only in devising techniques adapted to given instances of conflict, but also as an inherent part of the philosophy which underlies satyagraha. Over against the harassment and distress commonly effected in duragraha is set the fundamentally supportive nature of satyagraha. As the satyagrahi moves to bring about change in the situation through persuading his opponent to modify or alter the position under attack, he seeks to strengthen interpersonal relationships and intrapersonal satisfactions through acts of support and, where appropriate, through service to the opponent. This approach goes well beyond the nebulous and often platitudinous insistence that all men are brothers and that love for the opponent dominates the feeling and dictates the action. It is based upon a psychologically sound understanding about suffering and the capacity of man to change. The discovery that fundamental change is accompanied by suffering can be understood through introspection. The more rigid and fixed the attitude, or the more habitual the behavior, the more painful the process of change. Persisting, obstinate attitudes are not without their cause. They perform a function which has its origin in personal history and they are part of an intrapersonal economy, any disruption of which will be experienced as distress and even as a major personal threat. So it follows that change can best be effected in the context of reassurance and through efforts to define the limits of areas of attack. It may, indeed, be impossible to bring about a change in attitudes and to achieve the transformation of relationships without extensive reassurance and support. Otherwise the conflict becomes exacerbated, the opposition hardened, and the prospects of a life-and-death struggle intensified. When the dispute is about a simple policy change which does not challenge long-standing custom, or in which the emotional investment is low, then duragraha may well succeed. The undermining of the opponent may result in sufficient distress to bring about compromise and concession within tolerable limits of change. But when fundamental attitudes and long-established beliefs are challenged, the required change may be impossible to tolerate without considerable supportive effort. When change of such fundamental nature is involved, the harassment of a strike, demonstration, or other form of duragrahic attack will not achieve the response or perhaps will achieve it only through overwhelming the opponent and destroying the possibility of a sound, transformed relationship. Some form of destruction is involved in all change. In satyagraha the greater the expected change (and, therefore, the more radical the destruction of established patterns), the more essential it is to undertake counter and parallel constructive efforts of a high order. The creative process of satyagraha is applied in a supportive style towards a restructured end. This integrative mode of approach does not depend upon ideal views of mankind, but, rather, it is based upon the knowledge of the psychological needs common to every man. Wherever nonviolent movements are undertaken in the interest of asserting or establishing human or civil or “inherent” rights, the atmosphere is ripe for the emergence of an attitude which threatens constructive solutions. Self-righteousness is an extension into the realm of personal ascription of the sounder quality of moral indignation. Self-righteousness attaches to the actions of some through a failure to examine personal motives or to appreciate its affect in the objective circumstance. But to others, self-righteousness follows upon an explicit use of the alleged, or assumed, guilt of others. For there are those who set out to disclose the guilt of others, and to use this disclosure as a technique in prosecuting their “nonviolent” attacks. The purpose of this emphasis upon guilt and the manner in which guilt disclosure is intended to function is not always clear. It may be dictated by a consideration indirectly related to the given conflict, as for example, a commitment to an ideological position not germane to the conflict at hand. Among such commitments, perhaps the best known is the doctrine of class warfare. The author has on occasion heard participants in phases of the American civil rights movement instructed to disrupt business in retail shops for the purpose not only of putting pressure upon shop-owners to integrate their work force, but also of harassing customers so that they will recognize their own guilt. The argument is that the ordinary American housewife goes about her business in the markets with a false sense of innocence. She must be brought to understand that she, too, is guilty of discrimination. It may be that the unconcerned third party is in this way forced to recognize a fault and, in recognizing guilt, he (or she) will join or at least tacitly support the demonstrators. Such an expectation is, on its face, somewhat unrealistic, but however the expectation is to be assessed the procedure reveals a point of critical significance. When a group is enjoined to disclose guilt on the part of others, while at the same time they set about demonstrating their own guiltlessness, the mechanism suggests psychological projection, the true meaning of which is an unconscious sense of guilt in the demonstrators themselves. It may be guilt of prejudice against the middle class of which the American housewife is such an eminent representative. Or it may reflect unconscious guilt on the part of the demonstrator against the very persons upon whose behalf he is demonstrating. The symbolic meaning of such action is noted below (section III) in the discussion of symbolic violence. Whatever the objective, the interest in producing a sense of guilt through discomfiting others is destined to exacerbate the conflict. This may indeed be its intent, and certainly it might succeed, in uncomplicated situations where simple duragraha has some chance of success. But where extensive and fundamental change is desired, reliance upon this procedure will fail of any clear and constructive purpose. For guilt is a destructive force and is closely related to fear and hatred. Among the most constant and abiding efforts of the satyagrahi is the extension of areas of rationality. He recognizes the significance of the irrational, but, in contrast to the duragrahi, the satyagrahi seeks to minimize and not to use the irrational. The relationship to those one seeks to change calls for a high level of responsibility. It is incumbent upon the satyagrahi actively to concern himself with the problems he is presenting to his opponent. His recognition of the burden his demands place upon his opponent is a prerequisite to action. He is expecting his opponent to renounce or reject patterns of behavior to which he has long been accustomed, and often to reject behavior which appears not only justified to the opponent, but which may also seem to him to accord with high moral standards. If conventional social forms are involved which carry sanctions for failure to comply (as in the law or established custom), the demonstrator, by his act of contravention, is presenting to the opponent and to third parties formally not involved in the conflict, the necessity to make a choice. This choice may well require an act of faith on the part of the opponent. For the demonstrator is stating a position contrary to hitherto accepted form and usage. He is saying, in effect, “The established conventions and authorities are wrong; what I am doing is right; accept my way”. In acting upon this assertion, the demonstrator is calling for the opponent to have faith in the demonstrator’s judgment. A well-launched demonstration is calculated to confront the opponent in such a manner that he is forced to make a choice. Opponents and otherwise uninvolved onlookers are faced with the need to examine their own behavior. Conduct formerly taken for granted is in this way questioned. If the opponent and the onlooker persist in the old way, the behavior which was formerly habitual and automatic now is consciously undertaken, and for that very reason it is likely to gain the strength of conviction. The responsibility for forcing a choice requires to be seriously weighed. Questions should be raised about one’s justification in asking the opponent to trust this judgment, which is alien and unwelcome. When responsibility of this order is carefully studied, the need for supportive activity to the opponent can be more clearly understood. The details of support and the manner in which it may be undertaken can best emerge in the course of examining the extent of this responsibility within the context of a given conflict situation. When conscious decision is forced upon others, it becomes all the more important that guilt be dispelled, fear abated, and passions controlled. The forcing of new choices is a tactic for effecting change in a static situation. At the critical juncture when choice is forced, the satyagrahi must shoulder his greatest burdens. He will be confronted by persons seized with doubts and uncertainties, and it is his obligation to tolerate their abuse, should it be offered, and to find ways in which to strengthen and reassure his opponents. His own strength at such junctures is put to the greatest test, and his own capacity for creative thought and imaginative act is taxed to the fullest. As the satyagrahi engages his opponent in constructive conflict, his responsibility is to be understood also in terms of responsiveness. The open-ended nature of his objectives and the transforming function of the process require that he extend to his opponent not only the respect implied by humanistic values, but also a measure of trust which goes well beyond that tolerated by proponents of duragraha. It is of the essence of satyagraha that every response from the opponent be accepted as genuine and that all undertakings of the opponent be considered to have been given in good faith. In satyagraha this is not only a matter of strategy, based upon an active search for truth, but it is also an effective tactic. If the opponent gives any indication of changing his position and altering his behavior in either direction, this indication must be given full recognition. It is essential to accept as genuine threats of violence or acts of hostility as well as any expression of intent on the part of the opponent to move towards a resolution of the conflict. To demonstrate acceptance and belief in the opponent’s good faith will serve to hold the opponent to his word, to diminish his hesitation, and to encourage the realization of his perhaps shaky intent. It is a basic principle of satyagraha to consider as genuine all counter-suggestions. The proponent of duragraha is characteristically conditioned to doubt every move made by his opponent, and to suppose that his opponent is acting in bad faith. The opponent must be actively opposed, his every act suspected. This readiness to doubt the good faith of an opponent may be put forward as a piece of sophistication, based upon experience or knowledge of human nature. In operation such an approach is poor strategy and worse tactics. The satyagrahi’s move to credit the opponent with genuine intent requires the capacity to tolerate abuse (as in instances where the opponent has, in fact, acted in bad faith) and to exercise forbearance. Gandhi once said that, “impatience is a phase of violence”. (7) In duragraha, efforts on the part of the opponent are oftentimes flaunted because they may upset the timetable of planned demonstration and result in inconvenience to the demonstrators. At such times the opponent is especially likely to be suspect. The manner in which the duragrahi readily places demonstration at the top of his priorities, even at the cost of resolving the immediate conflict, is illustrated by many of the student demonstrations organized in support of the civil rights movement in the United States. The author witnessed one such demonstration in a university city. A civil rights group largely made up of students challenged merchants to include non-white employees in proportion to the city’s non-white population. After serious consideration the merchants did, in fact, take steps towards the integration of their employees and moved through the city’s welfare commission to set up a training program for potential employees from the minority group. Nevertheless, demonstrations and picketing were launched. When asked why they persisted in demonstrating even though the merchants had taken steps toward the desired objective, the leader of the demonstrators replied that the merchants had not acted in good faith, that their proposals were empty promises, and their hiring of a few Negroes amounted only to “tokenism”. In this instance there was considerable evidence that the merchants had, indeed, acted in good faith. To announce that the opponent was not acting in good faith could result only in bitterness and further conflict. One of the results in this case was the alienation of many townspeople who had initially supported the movement and who were potential supporters of all civil rights efforts. The demonstration in question illustrates these two characteristics of duragraha, failure to accept the opponent’s moves as being taken in good faith, and taking action according to the convenience of the demonstrators. The timing of this demonstration had been scheduled for Christmas week. Students had a holiday during these days and were free to demonstrate and picket. An even more important consideration was the business loss merchants would incur through interference with Christmas shopping. Paralleling these considerations was the suspicion that the merchants would do anything to prevent disruption of business during this most profitable season. The allegation that the merchants were acting in bad faith was conditioned by and to some extent arose out of this suspicion. In the incident cited above, the demonstrators were of the opinion that they were using Gandhian tactics. Any familiarity with Gandhian satyagraha would have precluded this misjudgment. Indians will remember well the occasions upon which Gandhi refrained from taking action against opponents when inconvenience to the opponent was evident. He would not allow a movement aimed directly at Englishmen to continue during Easter Sunday and, out of respect for his opponent’s susceptibility to tropical heat, he would call off action during the hottest hours of the day. It would have been in the Gandhian spirit had these student demonstrators (a) taken the merchants’ proposals as a genuine indication of their intention, (b) explained to the merchants that, even though their demands had not been met in full, they would withdraw their pickets during the important Christmas week so that business would not be unduly hurt, and (c) turned their efforts into solving the problems of organizing a training program to provide skilled workers from the non-white community. Those who lead movements aimed at effecting change have a choice of means, and in the storehouse of strategies symbolic violence ranks high in popularity. There is no denying that all forms of violence have some chance of success in securing immediate, well-defined objectives. Symbolic violence, as a form of violence, and duragraha as a form of symbolic violence, share this potential for success. We have seen above how satyagraha, as contrasted to duragraha, has superior potential in situations of conflict in which fundamental changes of attitude and behavior are the objective. A concluding word may be said about the nature of duragraha as symbolic violence and the limitations inherent in its use. “Symbolic” pertains to something that denotes or stands for something else. The distinction should be made between, on the one hand, that which stands for something else because it has been consciously given this significance and, on the other hand, that which represents an unconscious wish (e.g. to be violent). Those who consciously set out with violent intent and destructive objective to prosecute their action through means which are not physically violent may be said to engage in symbolic violence in the first sense, that their nonviolent acts have the contrived significance of violence once-removed. Those who, on the other hand, are attached to the ideals of nonviolence while at the same time they unwittingly engage in destructive acts, may be involved in symbolic violence described in the second meaning of “symbolic”. The individual who uses symbolic violence but who believes that he is using no violence may be unaware of the substitute nature of his behavior, which in its unconscious meaning is violent and destructive. The manner in which the guilt of others is used to promote a “nonviolent” movement, as illustrated above (in section II), can be better understood by applying this second meaning of “symbolic”. The destructive effects of violence are widely recognized, and it is readily conceded that these effects extend beyond the physical. Violence once-removed, through unconscious symbolization, and acted upon in ways which exclude the cruder physical forms of destruction may be more treacherous than frank and open violence. The use of a symbol, if the results are to be understood (to say nothing of controlled), requires a high degree of awareness. Those who consciously set out to apply symbolic violence have a better chance of control and effectiveness than those who proceed with forms of duragraha without the recognition that they are involved in violence-once-removed. It is for this reason that the leader who would organize a movement without violence should be pressed to understand his techniques and to explore his strategies. Wherever men meet to consider how they shall struggle against great odds for freedoms or for cherished rights, the name of Gandhi readily comes to their lips, and his image of greatness and success strengthens their will. Let them know the distinctions between Gandhian satyagraha and forms of struggle which are here described as duragraha. For without this understanding, the seminal contribution of Gandhi could be lost. For those who do understand the many ways in which satyagraha is distinguished, a challenge is posed: the methods must be refined and techniques developed for this age of advanced technology. The Gandhian philosophy of conflict resolution is sound. Who is to press forward the experiments in technique? The first step is to reject the falsity and failure inherent in duragraha. New strategies for the constructive conduct of conflict, building upon and advancing beyond satyagraha, can be designed, and techniques to implement them await invention. In the face of unparalleled risk, there are few challenges presenting such scope for creativity, and perhaps none holds out so much promise. (1) Satyagraha, as a word coined to describe the technique Gandhi first used in South Africa and which he continued to develop in India, is readily understood to mean the Gandhian method of conducting conflict without violence. The word satyagraha is a compound of two Sanskrit nouns: satya, “truth” (from sat, “being”, with a suffix-ya) and agraha, “firm grasping” (a noun made from the verb agrah, which is the root grah, “seize, grasp”, with the verbal prefix a, “to, towards”). Duragraha is infrequently used in the sense of social action. The prefix dur (used in compound for dus) denotes “difficult”. One meaning of duragraha is “bias”. I am introducing the word here not only to enable the discussion at hand, but also to promote the refinement of language in describing techniques of social action. Many so-called satyagraha campaigns could more accurately be described as duragraha. The usefulness of the word in this context will become clear as the text progresses. 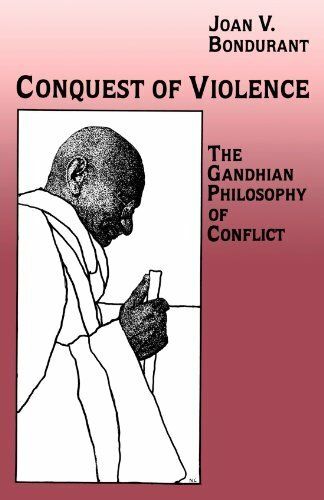 (2) Joan V. Bondurant, Conquest of Violence: The Gandhian Philosophy of Conflict, Princeton, N. J.: Princeton University Press, 1958, Chapter VI. (3) Quoted from Samuel Beer, The City of Reason, Cambridge: Harvard University Press, 1949, p. 42. Professor Beer develops “the philosophical ideas which support the theory of a free society”, and a political theory derived from Whitehead’s metaphysic “based on reason and directed toward liberty”. The philosophy on which his form of ethics is based “emphasizes the relativity of all institutions… the gulf between the ideal and the actual is never bridged, although the duty of man is continually to try to bridge it”. (4) D. G. Tendulkar, Mahatma: Life of Mohandas Karamchand Gandhi, Vol. V, 1938-1940; 8 vols. Bombay: Jhaveri and Tendulkar, 1952, p. 328. (5) Young India, 7 June 1920. (6) Ibid., 9 February 1921. (7) Ibid., 18 October 1927.